The following timeline provides the highlights of Second Unitarian’s history. Under the leadership of Rev. Robert Weston, the congregation of First Unitarian Church purchases property at 117th St. and West Center Road for $50,000 to establish a presence in west Omaha. Within 10 years, the West Meeting House space becomes inadequate. The property is sold in order to buy the former Westwood Baptist Church, our current location at 3012 South 119th St. On Sunday, Jan. 13, 1974, congregants from both locations join together to dedicate the new facilities to the “greater glory of the cause of liberal religion.” First Unitarian minister, Rev. Vester Vanstrom, directs the service. It is ultimately decided that if the west Omaha church is to be successful, it needs to be independent. 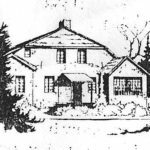 Thirty-seven people gather on Incorporators’ Night, May 23, 1976, to sign the Articles of Incorporation, legally establishing Second Unitarian Church of Omaha. The UUA admits Second Unitarian as a member church later that year in October. Rev. Deane Starr serves as an extension minister for three months to provide guidance and organization. Membership more than doubles to about 70. Rev. 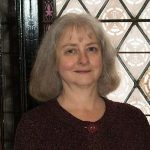 Betty Pingel, who had just graduated from the Iliff School of Theology in Denver, is installed as the church’s first settled minister on January 8, 1978. During her four years here, Rev. Pingel makes Unitarian Universalism better known in the community via her weekly radio programs. The contents are printed in a book she entitles Relationships with Life. From 1982 to 1986, Rev. Jane Mauldin serves as minister, followed by Rev. Carl Schmitthausler from 1987 to 1988. 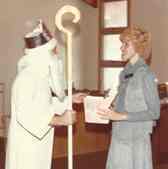 In December 1978 First Unitarian’s “Father Christmas” Don Wright presents the church deed to Second Unitarian Board Chair Cheri Cody. The congregation moves forward lay-led, with the goal of becoming a healthier church, setting aside money for a future minister. After more than 10 years of commitment, hard work and resourcefulness, the congregation applies to the UUA to enter the extension ministry program. In Fall 1999, the congregation begins attending quarterly weekend workshops with Rev. Gary Blaine to prepare itself for the arrival of an extension minister. Rev. Dr. Joshua Snyder becomes the extension minister of the 104-member congregation in August 2000. The Social Justice Committee sponsors many activities that year in the spirit of our tradition of social activism and community outreach. Many are connected to our interfaith work with OTOC. After three years of extension ministry, Rev. Snyder is called to be Second Unitarian’s settled minister. Rev. Snyder initiates a Meditation Group. Our religious education program thrives. We join forces with First Unitarian to form a dynamic youth group. 2003 Unsung UU Award – Cheri Cody. 2005 O. Eugene Pickett Award – Second Unitarian is recognized for its significant contribution to growth. 2006 Ellie Morton Award for outstanding work in religious education – Anita Jeck. 2006 Keeping the Faith Award – Clyde Anderson. 2007 Unsung UU Award – Denise McMillan. Upon Rev. Snyder’s departure in 2008, Stephen Sinclair (2008-2009) and Rev. Nancy Haley (2009-2010) serve as interim ministers. We co-host the Prairie Star District Conference and host the Social Justice Network Pre-Conference. As many churches see a downturn in their numbers, Second Unitarian holds its own as it calls Rev. Scott McNeill as its settled minister in 2010. Under Rev. Scott’s leadership, the church creates vital new programming, including service learning projects as well as affiliate groups for retirees and young parents. Upon his departure, Rev. Frieda Gillespie (2014-2016) serves as interim minister, helping us set goals to prepare for a developmental minister. Second Unitarian initiates Open Arms Trans Social Group. The support group meets monthly, drawing youth and young adults from a 100-mile radius. In August, 2016, Rev. Cynthia Simpson becomes Second Unitarian’s developmental minister. Our goals are to develop our membership, worship, organizational structure, and a clear sense of our identity.